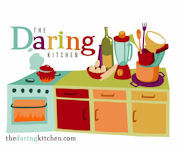 You know those kitchen projects you mean to get to, year after year, but never do? One of mine was cooking with fresh figs. I think the problem is that the season is so short; by the time I had a plan, the figs were gone. This year, cooking with figs actually had purpose for me. We’ve been focusing on healthy snacks around here lately and have been eating a fair amount of dried figs. I’ll be the first to admit that dried figs and a bit ugly and a bit chewy (particularly if you refrigerate them for freshness), and Dr. O wasn’t crazy about them. When I saw piles of beautiful, fresh figs at Whole Foods last week, I knew I had an opportunity to show him the fruit in its best light. Eight ounces of figs and a quick Internet search later, I had a plan for breakfast: Honey-Caramelized Figs with Yogurt. Dr. O loved every bite! Heat honey in a medium skillet over medium heat. Cook figs, cut side down, until caramelized, about 5 minutes. 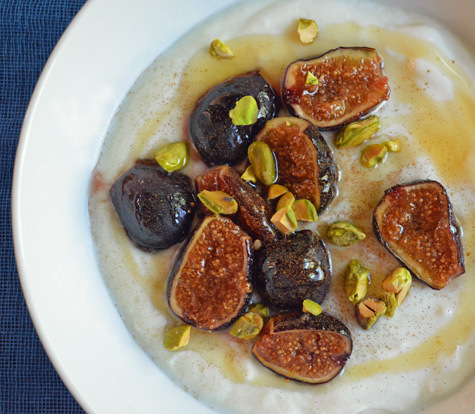 Serve over yogurt with cinnamon and pistachios. Drizzle with honey, if desired. Talk about a delicious and easy recipe! The flavor of the fresh figs was just incredible. They were rich and sweet with pleasant chewiness in the flesh and crunch in the seeds. Add extra crunch from the pistachios, extra sweetness from the honey (necessary, I think, since the yogurt is unsweetened), and creaminess from the yogurt, and you have a tasty, gorgeous breakfast. If I can get to it before figs are out of season, I’ll definitely make this one again.